Over the past 50 years, the topic of global warming and the effects of human consumption have been debated in academia, government agendas and in public forums. While a complex topic, people tend to debate from two beliefs: that human consumption patterns have affected climate change- primarily through the increase of greenhouse gases, and that climate change is natural and not impacted by our behavior. This article is rooted in the belief that human consumption does affect global warming and climate change. How fast is the Earth warming up? While a temperature increase of 1 degree Celsius may not seem like much, one should keep in mind that if the global temperature dropped by 2-5 degrees Celsius in one year there would be an ice age. Every year we see the impact of the rising global temperatures through the rising of ocean levels, the decrease in annual precipitation, and the increase in number and severity of natural disasters such as floods, hurricanes, and tornadoes. As these activities occur, there is a change in quality of life for humans, in terms of health, economy, and comfort, in addition to changes in ecosystems, which causes animals and plants to become endangered and extinct, because they are unable to adapt to the quickly changing environment. Advances in scientific technology, increases in environmental funding and volume of raw environmental data, have assisted scientists in advancing research to determine what is attributing to global change, and how we can work to reduce it. From this research, governments have created stricter environmental laws, created public awareness campaigns, added environmental science into school curriculum’s and much more. With the public being made fully aware of the impacts of their everyday decisions on the environment, there has been a rise in activism and the creation of non-profit organizations, who work to make the problem more known, and suggest solutions. From this, there has been an onus placed on corporations to reduce their environmental footprint through a reduction in production emissions, packaging waste, and reducing the overuse of limited natural resources. One result from the work of scientists, nonprofit agencies, activists and governments, is a well-informed public, and an emerging discourse around sustainability. There are more openly public discussions about the state of the environment, as well as debate on topics such as how to reduce the amount of waste we create, how to shop more suitably, and how to reduce individual environmental footprints. While creating a culture of environmental sustainability is amazing for the prevention of further environmental damage and climate change, what many do not consider or have given up on is the concept of cleaning up the physical damages that we have caused, such as the plastic in the ocean. The dominant mindset surrounding this has been “what’s done is done, there’s not much we can do about it now”. That is until 18-year-old Boyan Slat, founded The Ocean Cleanup project. 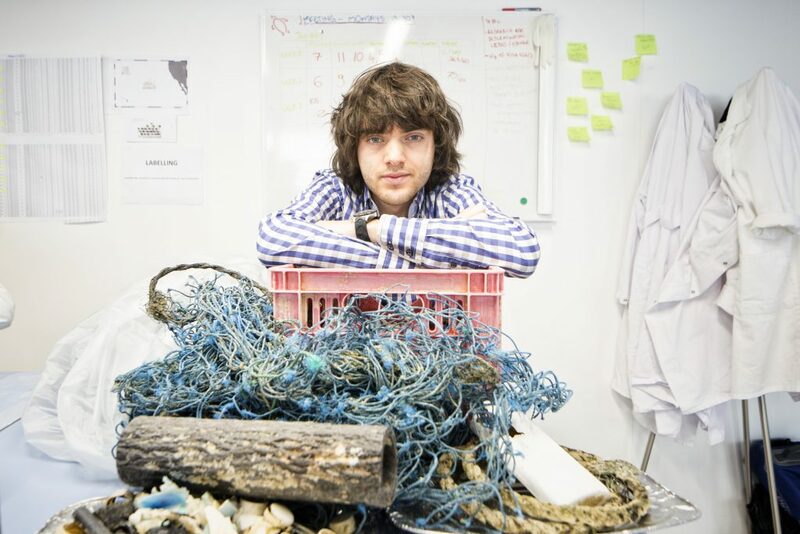 With a big idea to engineer a passive cleanup system that uses the oceans current to collect the plastic, Boyan Slat presented a TED talk and set up the world’s most successful Kickstarter campaign. Today, The Ocean Cleanup has a team of over 70 engineers, researchers, scientists, and computational modelers, who all share the goal of cleaning up 50% of the Great Pacific Garbage Patch (GPGP) in just 5 years. Before implementing a state-of-the-art engineered system to clean up the plastic in the GPGP, the team first had to understand the size and scope of the patch itself, and gain a better understanding of how ocean currents work. To do this, the team executed two expeditions to sweep the GPGP by boat and by plane. In 2015 the mega expedition, saw 30 vessels sweep the patch with trowels and researchers aboard to produce the first ever high-resolution map of the GPGP. And in 2016, the first ever aerial mapping of a garbage patch took place, using Teledyne Optech’s CZMIL Nova bathymetric lidar system and ITRES’ hyperspectral SWIR imaging system, SASI-100A. For the first time, researchers were able to see the size, depth, and composition of the GPGP. For more information about the imaging technology involved in the aerial expedition, check out our article “How Lidar is helping to clean up our oceans“. On March 22, 2018, The Ocean Cleanup released a scientific report, stating their findings from the past three years of research, including data from two expeditions revealing the size and scope of the GPGP. The Great Pacific Garbage Patch is located halfway between California and Hawaii, and is defined as an area with over 10 kg of plastic/km2. With this definition, The Ocean Cleanup has identified the GPGP to be 1.6 million square kilometers, and to contain 1.8 trillion pieces of plastic weighing 80,000 metric tons. This is as much as 16X larger than what researchers initially thought and demonstrates why The Ocean Cleanup must continue their efforts to clean up the ocean starting with the GPGP. However, even with news that the GPGP is 16X larger than anticipated there is some bright news, despite the GPGP being 3X the size of continental France, only 8% of the mass is contained in microplastics defined as pieces smaller than 5mm in size. The majority of microplastic in the ocean is a derivative of large pieces of plastic, that have been broken down in the GPGP by the ocean currents and UV rays from the sun. What makes this good news is that the remaining 92% of large plastic is easier to collect and remove from the ocean preventing the creation of more microplastics, which are often confused for food by marine life. Over the past 3 years, The Ocean Cleanup team has learned the size and scope of the GPGP to use as baseline data. As well as developing the cleanup system itself, prototyping it in controlled circumstances, as well as in the North Sea, to ensure that the system will be able to withstand the natural conditions of the ocean and deliver the best results. The first GPGP cleanup system is currently being assembled in Alameda, San Francisco, Bay Area, California and is expected to deploy in July/August 2018. This system is fully autonomous, energy neutral and fully scalable. Using an automatic identification system and telemetry, The Ocean Cleanup team will be alerted when a system is full and will then send a vessel to retrieve the plastic from the system. Once the plastic is on land it will be processed, recycled and sold to business-to-consumer companies. Profits made from these sales will be used to fund further ocean cleanup initiatives, with a global scale up expected in 2020. Click here to learn more about The Ocean Cleanup.